It’s that time of year again – the time for holiday decorations, gifts, and snow, or, in the case of many riders, owners, and trainers: palm trees, horse trailers, heavily packed tack trunks, and warmer weather. As horses across the country and across disciplines are shipping to more temperate locations for the winter show season, there are several things you can do to help ensure a smooth southern migration. Here are four tips! 1. Make a list and check it twice – or arriving down south may not be as nice. Remembering to pack up all of the tack and equipment you will need for the winter—your horse, any feed and bedding needed for the trip, and all necessary paperwork—can be an overwhelming amount to remember. That’s why it’s important to make well-thought-out lists of what you need before you just start throwing items into tack trunks! Consider breaking down your lists either by category (i.e. tack, grooming equipment, blankets and “horse clothing,” feed, etc.) or by horse. 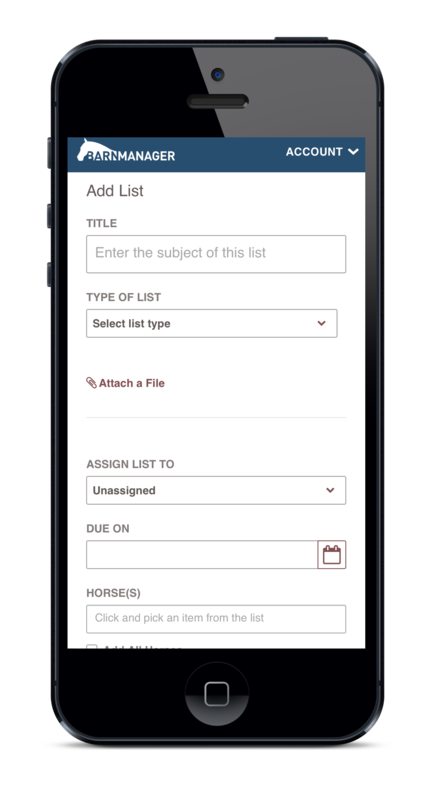 With BarnManager’s customizable list tool, you can do either, including setting up your own checklists and tables any way that you like and even linking lists to specific horse profiles to remind you of each horse’s packing needs. + Traveling items such as a spare halter, hay net and hay, buckets for water, and any shipping boots or wraps. + An equine first aid kit containing disinfectant, electrolytes, a thermometer, gauze, Vetrap, and bute. + Grooming and bathing essentials including brushes, curry combs, hoof pick, hoof polish, baby oil, fly spray, detangler, shine enhancer, sweat scraper, shampoo, conditioner, sponges, and rags. + Tack and equipment including saddles, saddle pads (for both schooling and show), girths, bridles, bits, spare stirrups and stirrup leathers, an extra set of reins, any boots for the horse, martingales, breastplates, a leather punch, a lunge line and lunge whip, studs and a stud kit, coolers, sheets, and blankets. 2. Have proper documentation ready. In order to be shipped commercially or across state lines, each horse will need documentation of a negative Coggins test, as well as a certificate of veterinary inspection (or health certificate). Most states require that the negative Coggins test was produced within a year prior to travel, but some require that the test was performed within 60 or even 30 days before traveling. Regulations also vary by state for how recent the health certificate needs to be; some are valid for six months, some for only 10 days. Talk to your veterinarian about what the requirements are in your state and within the states that you’re traveling through or to. For ease of access, keep your horses’ Coggins, health certificate, and any veterinary records in BarnManager so that they are always readily available on your phone, iPad, or computer. 3. Ensure the health of your horse. 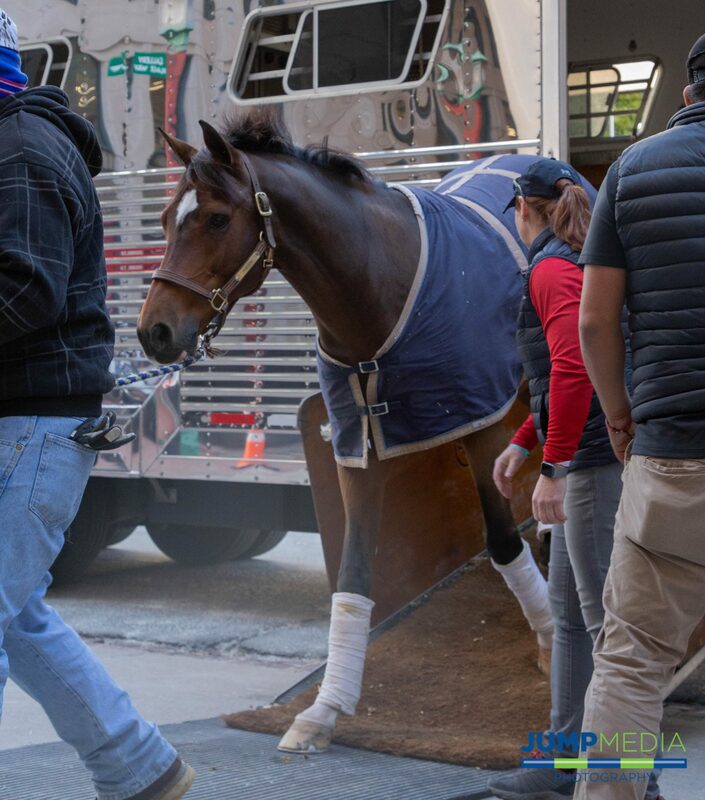 Long distance travel can be stressful for horses and humans alike, and horses can be prone to problems like shipping fever (a term often used to describe any viral or bacterial respiratory infection a horse contracts while traveling). In order to do all that you can to prevent such concerns, make sure that any animals being shipped are up to date on vaccinations and in good health at the time of travel. 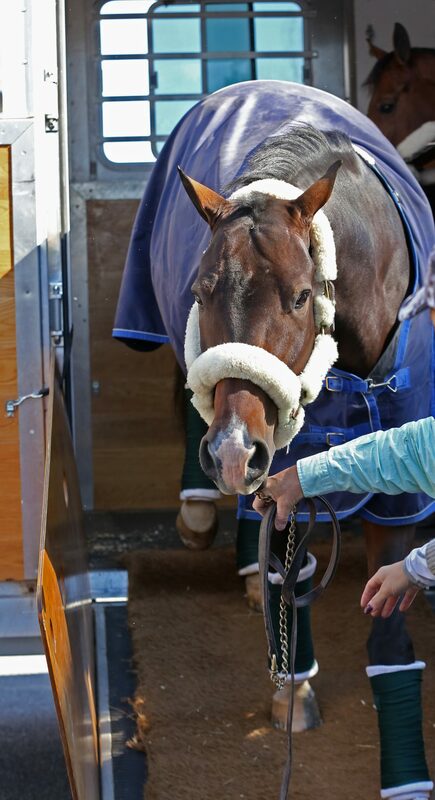 In order to reduce the risk of shipping fever, ensure that plenty of low-dust hay is provided for the horse during travel, and allow the horse to periodically lower its head while in the trailer. This allows the horse to clear particulate matter from its respiratory tract. Shipping fever has also been linked to stress, so avoiding shipping one horse alone for a long distance, which can induce greater stress, is also advised. If you are not shipping your horse yourself, it’s important to know that you have arranged a transporter that you can trust. If you don’t know where to find one, consider using a service like Equo. The horse transportation application makes it easy to find and schedule reliable drivers with at least two years of experience, GPS accessibility at all times, and rigorously inspected trailers and vehicles. Equo also allows for the shipment of a reasonable amount of gear along with the horse at no added cost, as well as, in many cases, one human ride-along! Once you’ve followed these four tips, you’re on your way to hitting the road! Safe travels!